This is the second post of my series about memory management. The previous post was a basic introduction, covering how the operating system views memory. In this, and the next, post, we’re going to dive straight into the C++ code, and implement two very simplistic allocators. These two allocators are not useful for any form of production code, but they will (hopefully) provide a basic foundation for future, more advanced allocators. We will look at a very trivial fixed size allocator – a bitmap allocator – and, following that (in the next post), we will look at a more flexible system. A bitmap allocator is a trivial memory allocator algorithm, which, at its core, uses a structure called a bitmap to provide the book-keeping information. Fundamentally, a bitmap allocator has two regions of memory (that may be part of the same contiguous block), a management region – the bitmap – and the arena, a catch-all term for “usable memory”. The two regions are related by a mapping (or magnification) factor – each discrete element in the bitmap (often a single bit, hence the term), maps to some number of bytes in the arena. The bitmap itself is a contiguous array of these elements, which is like a scaled down version of the arena, only instead of storing the user data, it simply stores whether each section of the arena is used or not. Trivial implementation has expensive allocation, cheap freeing. The bitmap allocator is extremely simple to implement. It needs to maintain a pointer to the bitmap, as well as a pointer to the arena. In the simplest design, it needs only two more fields – the number of blocks it owns, and the size of each block. For simplicity, we will be using a bitmap where each element is of size unsigned char. The bitmap must contain slightly more information than used and free, we will need an additional state for boundary, a state indicating that it is the start of an allocated block. 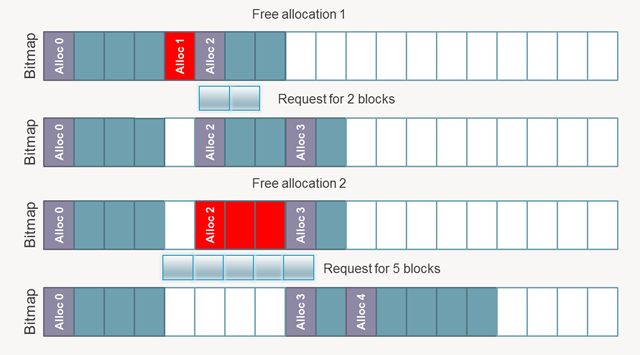 Initialization is very simple; it requires calculating the number of blocks given a specified arena size and factor, allocating the two regions, and setting all the entries in the bitmap to free. Our memory system will sit on top of the CRT malloc function. Smaller factor sizes mean additional book-keeping (unusable memory). E.g., a factor of 4 means for each 4 bytes of usable memory, a byte of memory must be dedicated to book-keeping. Larger factor sizes mean more wasted memory. It is sensible to require that the factor size is a power of two, or a multiple of a power of two. In order to ensure happy calling code, it is good to assume that any memory request over 16 bytes should be aligned to a 16 byte address; something that can be done by requiring that the factor is a multiple of 16. Shutdown is a trivial matter of freeing the two memory blocks we have requested from the CRT. The see note part of the code above is because, strictly speaking, the standard requires that a zero byte allocation returns a unique memory address. In this case, we will flaunt the standard and simply return null. Begin marking blocks as free, the first block should be a boundary block. 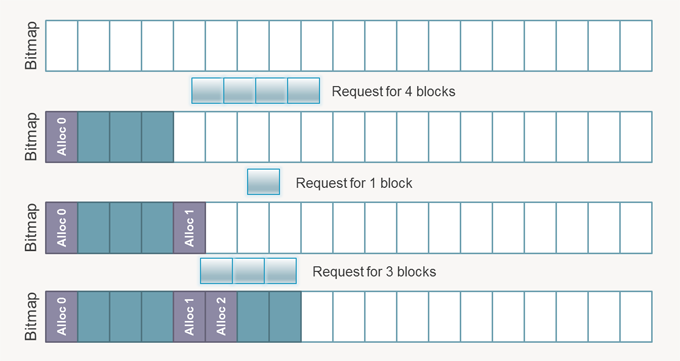 Iterate forwards over the blocks in the bitmap until another boundary block is encountered, then stop. The bitmap allocator is an incredibly simple allocator. It has very little state information, and is the simplest form of allocator to implement. It is very fast at releasing memory, and a more serious version of the algorithm can speed up the allocation code enormously (using, for example, a free list, or by storing information about contiguous free counts in the bitmap). Unfortunately, it requires a large block of book-keeping memory to function, which remains constant. In addition, by its very design, it is inherently wasteful for small allocations (given that the size of an allocation is always a multiple of the block factor). Nevertheless, in about 100 lines of code, we have come up with a workable memory manager. It doesn’t support resizing of the arena, and it doesn’t provide a particularly usable or scalable system for an actual application, but, it is a good contrast to the next allocator we will look at; which has a very different design. Once we have covered these two designs, we will look at more advanced algorithms to improve them, working towards a fully featured memory system.